Time is one thing which all parents never seem to have enough of. Before your little bundle of joy arrived, you could spend hours cleaning, getting ready and organizing the day’s activities. Now, it seems like a huge struggle just to get showered in the morning! Becoming an organized mom or dad is tough. 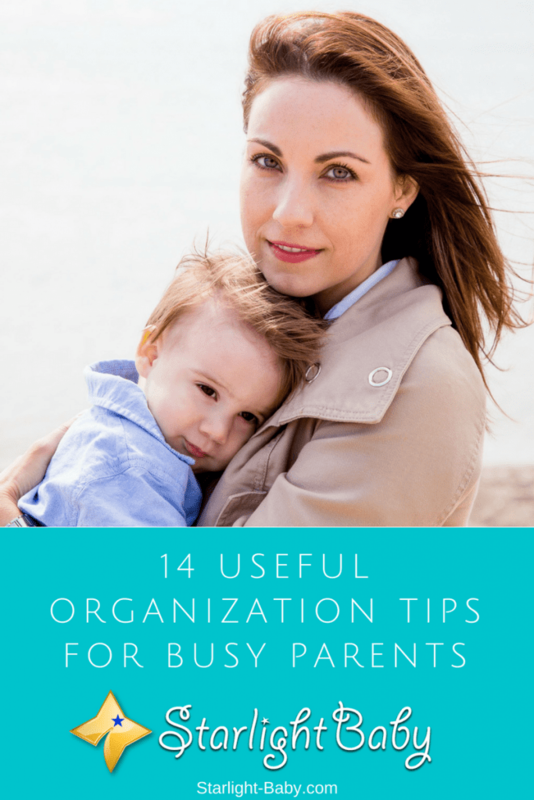 If you’re looking to regain a little structure in your life, here you’ll discover 14 essential, time-saving tips that will help even the busiest of parents become more organized . Calendars are a fantastic tool every parent should have. When you’re constantly rushing around and not sleeping properly, it’s easy to forget things which need to be done. Writing important tasks into a calendar can help you to ensure you never forget anything important, and it adds structure to your day. Use it to record which days your child has activities, schedule in date nights for you and your partner and plan a day each week to clean. Knowing exactly what it is you have to do on each day really helps you to plan ahead and be a lot more organized. A common struggle many busy parents have is knowing what to cook for dinner. When you have a million and one things to think about, dinner is often last on your list. So, when dinner time comes around, you may find you either have no idea what you’re going to make, or you simply don’t have all of the ingredients in to make something. A meal planner is a great way to stay on top of dinner times. It allows you to plan meals in advance, ensuring you know exactly which ingredients you need to buy for the week. You can also come up with bulk meal ideas which you can prepare and cook on one of your less busy days. If you find Sunday is typically a more relaxed day (if there is such a thing for a parent! ), you can create a meal in bulk to tide you over for a few days, saving a lot of time during the week. A good tip is to write bulk cooking days into your calendar to be extra organized. Each day, there’s a small window of opportunity to get things done while your child is sleeping, playing, or resting. Use this time wisely to tick off the most important things you need to do. For example, you could use the time to relax and sleep yourself if you’ve been struggling with sleep deprivation. It may seem like a waste of time when you could be using it to do chores. However, looking after yourself and ensuring you’re well-rested is essential to surviving the infant and toddler years! It’s hard to be organized when the house is full of clutter. So, start by making a list of everything in the home. Then, mark off the things you don’t use or need. Some people find it quite difficult letting go of things just in case they need them at a later date. A good rule to go by is if you haven’t used something for six months to a year, it’s unlikely you’ll need it again. If you’re struggling to justify getting rid of the clutter, consider the extra space it’s taking up, as well as the additional work it’s causing you by having to clean it. Do you find mornings to be the busiest times? For many parents, trying to get their kids as well as themselves ready, is one of the most challenging parts of parenting. However, you can ensure it’s as stress-free as possible by preparing as much as possible the night before. Each night, lay out your little one’s clothes for the day after. If your toddler is off to preschool, make sure they’re bag is packed and create a packed lunch to store in the refrigerator. You’ll be amazed just how much time this saves in the morning. Of course, you’ll still have the stress that comes with trying to get your little one dressed and the usual breakfast battles, but you’ll find them much easier to deal with thanks to the preparation you did the night before. Do you find a lot of your time is taken up responding to phone calls? Maybe you get part way through the housework only to have stop to answer the phone a few times? It may not seem like much, but constantly taking phone calls can really cut into your daily schedule. If this sounds like a problem you’re having, limiting your calls to certain times of the day can really help. But what if the call is important? Well, ask your friends and family to send a text or voicemail if you don’t answer and it’s an important matter. So, if you’re setting time out each day to focus on something such as housework, make sure you limit disruptions during that time. One of the biggest mistakes you can make is to try to do everything all at once. Take de-cluttering for example. If you need to de-clutter the entire house, you’re going to get extremely stressed out trying to do it all in one go. Instead, split it down so you do little bits each day until it’s finished. You might have been able to get away with spending hours sorting things out before you became a parent, but it’s just not realistic anymore. As cleaning is one of the biggest challenges when you’re a parent, it’s a good idea to make it as easy as possible. Try using comforters instead of blankets to speed up making the bed for example. You can also keep sponges and cleaning products in each room (obviously out of reach of your little one), so you can do quick wipe downs of counters. Look at how each task could be sped up and take advantage of time saving measures. If you find you’re constantly whizzing around, trying to get the kids to various activities, why not consider carpooling? You and other parents can take it in turns to drive the kids wherever they need to go. You could also arrange playdates where one day the kids stay with you and another they stay at a friend’s house. This gives you at least one day or a few hours of a day each week, to focus on anything you need to get done. Of course, there’s also the additional benefit that carpooling saves you money as you’ll be driving around much less, saving fuel money. Make daily errands less stressful, by maintaining them via a computerized checklist. Add everything you need onto a list, print it out and then check it off on your next trip to the grocery store. That way, you’re not going to forget anything you need, cutting down errand time significantly. These lists can also work for practically anything you need to get done. There’s also the additional benefit of feeling a sense of pride and order as you tick things off the list. If you look around, there are planners, organizers and printables to download that make it a lot easier for moms and dads to keep everything together. Have you ever tried to tidy up with a hyperactive toddler constantly demanding your attention? It’s hard work! So, why not eliminate the problem by encouraging them to get involved. Obviously, they can’t help you tidy the entire house, but there’s plenty of small chores a toddler can help with. They could help put their toys away, wipe low surfaces with a cloth and help to pass you things that you need. You’ll be surprised how much toddlers actually enjoy getting involved in grown-up activities. So, not only will it speed up your chores, but it’s also a chance for the two of you to bond. How long do you spend trying to find all of your child’s toys around the house? Make clean-ups easier by placing toy baskets in each room. That way, the toys can be gathered quickly and placed into the main toy basket at the end of each day. The final tip that’s potentially the most important to remember, is that no amount of organization will allow you to get absolutely everything done. There will always be more to do than you can physically get done in a day. You’re only human and when you’re parenting a baby or toddler, you’re never going to have enough time. Rather than stressing out over this, accept it. Eventually you’ll start to have more time that can be spent doing chores, so just try to make the most of the time you have with your child for now. Overall, staying organized when you have a baby or toddler to look after isn’t easy. However, the 14 tips above can really help to make life that little bit easier. Do you have any additional tips? We’d love to hear them! Your tips are always spot on! It is really hard trying to juggle your daily responsibilities and your newborn. I still remember the start and my struggles. I did some of the tips you’ve listed, like writing a checklist so I wouldn’t forget things, I ALWAYS prepared everything for the next day so it was ready ahead and that would save me a few extra minutes when I woke up. Also, the most beneficial is definitely cooking in bulks. What I did was, every weekend I cooked a bunch of different meals that I would use throughout the week. Then when the meals were cooked I’ve put them in the freezer. So whatever we’d decide to eat, it would be there and all I would have to do would be to unfreeze it. That saved many, many hours. But don’t worry, once you get the hang of it, it will only get easier. My wife and I are working parents. We have a five months old baby and it is becoming very difficult to manage our personal obligations and professional obligations. Currently, my wife is working part-time. She teaches in a community college and her durty hours is in the morning. When she is away for work, I look after the baby. I have a daytime job, my wife looks after the baby when I go to my workplace. I found this article very helpful. I will remember some of the tips mentioned here. It’s truly stressful combining both work and taking care of kids at the same time. It’s never an easy task for a parent who didn’t plan well for it on how to deal with the pressure. Kids can be very demanding and as a parent, you must attend to them but that is not what your job or boss cares to know as long as you are dependent on the salary. I have know some mothers who actually had to quit their jobs simply because they couldn’t find a way to manage both their jobs and taking care of their kids. It’s quite a pity that some parents had to pass through such sick situation. But the tips outlined here in this article is definitely going to be a great help to such parent, as it gave some guidelines on how to be able to manage the two and not getting caught up in between.